When wrapping the pearls on either side do you have any secrets about getting the wraps so perfectly uniform? Also, your question about being able to see something with the pendant and mention adding a double wrapped pearl and making a necklace…. How would I add a tiny pearl or bead (perhaps 2-3mm) to the top wrap and make it roll down onto the pendant in a swirl? I would love to do this with the beads I’ve chosen for my dendant. I’m using a long star like cut turqoise colored bead with the copperish colored lines in it, a brown goldstone round dangle, and I’ve chosen 22g 1/2 round copper wire.With the earrings I used a different shaped turqouise colored bead, the brown goldstone, and left my top wrap long enough to wrap the copper wire around the turqoise bead and tucking the tail between the 2 beads. OK, to make more uniform wraps above and below a pearl or bead used for a rosary link, make a wrapped loop with 2 or 3 wraps and then measure the distance wrapped and find the location on your chain-nose pliers that is the same size across as the length wrapped – use that pair of pliers to hold the spaces to fill with wraps. If I am ‘seeing’ what you describe with the pendant design, maybe use a twisted 24g square wire, make a tiny rosette at the end, slide on the bead and then wrap the wire twice around the top wraps of the wrapped loop and then ‘place’ the bead wherever you would like it. I really like your idea of mixing a turquoise color with brown goldstone – seriously, I have never done that and it sounds gorgeous! Keep working and let me know how it all turns out! It’s taken a long time to view these online, but finally success. I loved the versatility that could happen all from something so simple. You are so right about keeping it simple, customers absolutely go bonkers over the simple. Things that are simple really have an elegant look. Thanks for teaching. Hi Teresa! I am so pleased that my instruction works for you. (With the big sale this weekend the servers have been getting a major workout and I have had a difficult time getting in to work on tips too!) I have just visited your site and I really like your ‘Angels’ as they are also simple and elegant. It’s going to be fun to see how you incorporate these techniques into your new designs. I have learned a lot! I have made the items using copper wire and am planning on taping the samples on the large note cards on which I made my notes and some of them I made samples at the various stages so I will know what my notes mean later on. I have been looking forward to working on these classes, however, after going through the first lesson I have found that even though I purchased the supplies that accompanied the classes, the wire is not sufficient to cover each of the projects included. 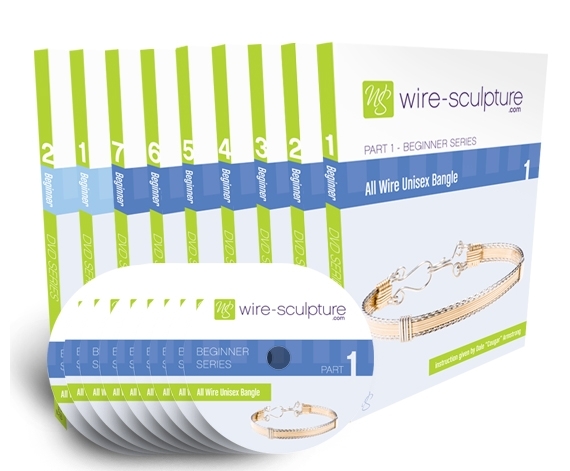 I have purchased some wire independently, but not some of the correct wire which is suggested for these projects. I’m a bit disappointed since I thought by purchasing the supply kit everything would be included and ready to go for all of the projects. LOVE THESE ONLINE LESSONS!!! I just ordered this program and in Lesson 1, you were working with the “S” hook. What is the measurement between the center mark on the 2-3/4″ wire for the 7/8″ hook? I couldn’t find it when I backed up. I love the second earwire that’s really round and has the swan neck and you could make a spiral towards the center of the earwire and forge it and have a dangle or bead in front of it? I’m always I will forge it too much and that it would be brittle, thank you for steering me right on this. I’m not wire wise, so I’m learning a lot!! Keep this up – it’s great!! As for the ‘S’ hook measurement, I’ll look it up and get back to you soon! For the Larger link: find and mark the center of the wire, also mark 3/8-inch/10mm to each side of the center mark. Again make a tiny loop at each end. Place round-nose pliers on the side-of-center mark and roll the wire in the opposite direction of the loop on that side, toward the center, until the back of the loop meets the straight wire. I can’t believe I am getting to communicate with the Cougar! Loved this lesson for a number of reasons. I have been beading for quite a while; however, my wire wrapping skills mostly revolve around rings as I have been working through your “ring series.” I sell my jewelry through a little place called Handmade Galleries near LA, mostly neckpieces. They have been asking me for some smaller “bread and butter” pieces like earrings and bracelets. I have always been kind of intimidated by earrings, getting them to hang right and the whole left/right thing. 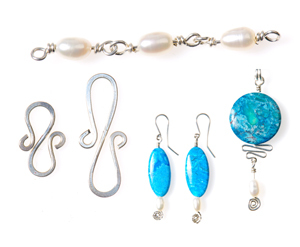 This lesson showed me just how easy it is to make a simple set of earrings and a pendant with plenty of room to branch out creatively. I am excited to create some smaller pieces tomorrow and send them off to Handmade to see if they sell! Thank you so much for the inspiration, Dale. I really needed to get my hands on the bench block and hammer to realize how cool it is to create those different textures, too. Wow, I am so pleased to hear that you are ‘working through’ the ring series! So many folks don’t realize that to make rings correctly (and easily) they should begin with Lesson 1 and progress through the rest in order. It is also nice to hear how this first on-line class has helped you to expand your inventory by tying it in to your imagination. (I also love forging with hammers.) Awesome! If you have any questions about these classes, please do not hesitate to ask. Great class! So very nice to be able to sit down when I have the time to have a class. Thank you so much for finally doing this for those of us that are not able to attend your classes in person. Almost makes you feel like you have your own personal training right in your home. I have one question about the ear wires. In one of your videos, you talked about the bottom of the ear wire not pointing out so it could poke you in the head. You mentioned you liked to have them pointing the other way. Not real sure what you were talking about and have not seen this done on any of your videos. Could you please explain or show a picture of these wires. Hi Patt, You are welcome!! I am so pleased to be a part of this new feature with Wire-Sculpture. As for the ear wires, instead of ‘bending’ their ends out toward the back—’roll’ the ends toward the front! This set of lessons is a great idea. I have rarely taken the time to make my own components, thinking they just weren’t worth the time or trouble. This class shows how really simple they are to make and in some cases using scraps. I am looking forward to the next class.